If you are caring for rabbits as pets, you might need a few tips to help you make the most of your relationship. Here are some of the most important pointers you want to keep in mind. 1. Try litter training – Rabbits can learn to use a litter box. Make sure you use a rabbit litter that will be safe, such as ones made from corn cobs or recycled newspapers. Stay away from the clumping variety. 2. Bunny proof your home – Make sure nothing is around that your rabbit can chew on. Remote controls, electrical cords, shoes, and other items need to be put up or protected. You can also use baby gates to limit where your rabbit can go. 3. Find a vet with rabbit skills – If you are dealing with a rabbit runny nose, you need a vet who understands the needs of bunnies. Call around for a vet who specializes in small mammals. 4. Add vegetables – Your rabbit needs to eat fresh vegetables as part of his diet. Give small amounts of different ones until you see which veggies he likes best. Leafy lettuces are usually popular but avoid cabbages and iceberg lettuce. 5. Watch weight – Part of caring for rabbits is helping them keep a healthy weight. Avoid pellets and treats high in protein, fat, or sugars because these can increase the risk for obesity, especially with older rabbits. 6. Check out rabbit hair loss – When a rabbit loses hairs in patches not due to normal shedding, you should consult your vet. Causes can range from parasitic infestations to bacterial infections to hormone problems. 7. Watch for rabbit mites – The mites are not that unusual on animals, especially if they spend much time outdoors. Watch for symptoms or “moving dandruff” on your pet then head to the vet for the appropriate treatment. 8. Keep foods pesticide free – A wild rabbits diet consists mostly of leafy plants, buds, and bark but you’ll be feeding your pet from the produce section so try to focus on fruits and vegetables not treated with pesticides. Even trace amounts can build up and be harmful to their health. 9. Groom your rabbit regularly – As part of your caring for rabbits routine, brush them regularly to reduce shedding, to prevent the ingestion of loose fur which can lead to digestive blockages, and to provide bonding time for the two of you. 10. 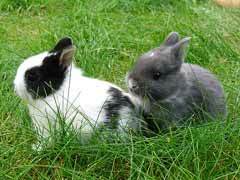 Keep your rabbit indoors – Outdoor rabbits are usually unhappy. They don’t like being alone. Keep them inside and use the other tips above to keep your home safe for him so he can be part of the family. When you are caring for rabbits, all of these tips can help the two of you have a happier relationship.